Coming soon to Train Simulator from Johan Pretorius (Johansteam) and Hermann Kühne, their next South African route shall bring to life the New Cape Central Railway’s captivating Mossel Bay route. Discussions for this new railway line in South Africa were first had in 1883. The intention was to link villages and agricultural land to Cape Town, allowing for faster transportation of fresh produce into markets there. Farmers were quick to persuade entrepreneurs that were based in London, England to set up the Cape Central Railway, and kick off its construction eastward from Worcester to Roodewal (now Ashton) via the Breede valley. This 70 km railway was constructed over the next few years and public services started running in 1887, initially across a short section to Robertson, with the full line opening some 10 months later. Unfortunately though, competition from ox-wagon traffic was too great, and the CCR was declared bankrupt after only 2 years of operation. This was only the beginning of the railway’s journey though, services struggled on until 1892 when it was sold to a brand new company, the New Cape Central Railway. The NCCR’s plans for the dwindling line were much more ambitious – an extension to Mossel Bay. This was to be no mean feat, the bay in question resided some 200 km further from Ashton (as the crow flies) and between the two laid challenging yet scenic terrain. Nevertheless, the NCCR got on with acquiring land and started extending the line eastbound; Swellendam was reached by 1899 and Riversdale in 1903 – the latter proved particularly challenging due to the outbreak of the Boer War, which saw changes and slowdown in construction. In order to achieve such expansion so quickly, a simple path through the rugged hills was not possible, instead, the railway weaved its way up and down each slope – following the path of the land instead of ploughing through it. This, plus a cheaper than standard rail, resulted in slower speed limits throughout and a more challenging (and breath-taking) journey through the rolling fields of South Africa. The line finally reached the eastern coast at Voorbaai in 1906, where it joined up with the Grand Junction Railway and its George – Mossel Bay line. The NCCR was complete, and it was a success, it eventually took over operations to George and trains were running regularly across the 320 km route. The line was soon incorporated into the greater ”South African Railways” and was also upgraded to full mainline status (by means of replacing with sturdier rails) by 1931. The railway was known by many characteristics in its heyday, but none are quite as distinctive as its smell. Most railways around the world can’t be defined by smell, but the NCCR’s Mossel Bay line was different; a mix of coal smoke, and plants local to the region, gave the entire line an unmistakable aroma that stuck with workers and enthusiasts alike. 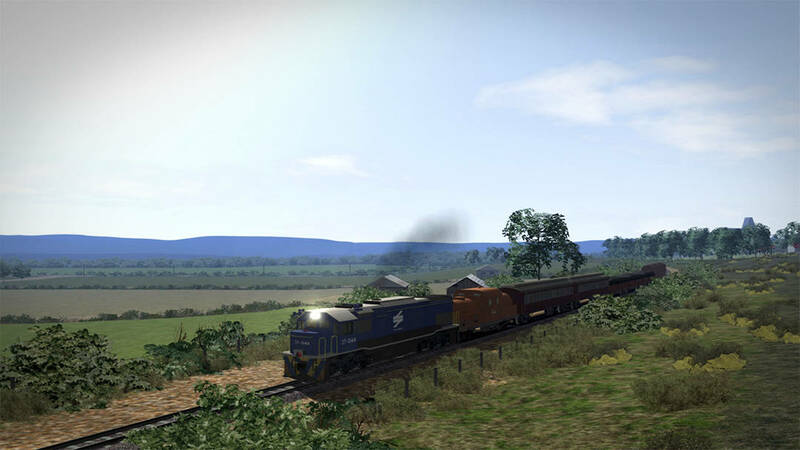 Now, while Train Simulator doesn’t support the accompanying scents, that hasn’t stopped Johansteam and Hermann Kühne from working hard to recreate the Mossel Bay line in full, sprawling across 320 km of unique and varied landscapes, capturing the feel of the line in true “head out of the cab” style! Accompanying the Worcester – Mossel Bay route will be the South African Railways Class 37, as well as a collection of freight and passenger rolling stock for appropriate mixed-traffic haulage. Watch this space, as the Worcester – Mossel Bay route is coming soon to Train Simulator!